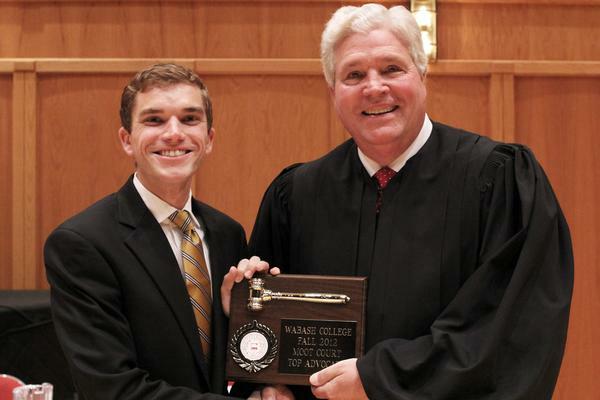 For Wabash senior Riley Floyd it was more than third time as a charm it was the confidence as an upperclassmen to claim the 2012 Moot Court top litigator award. 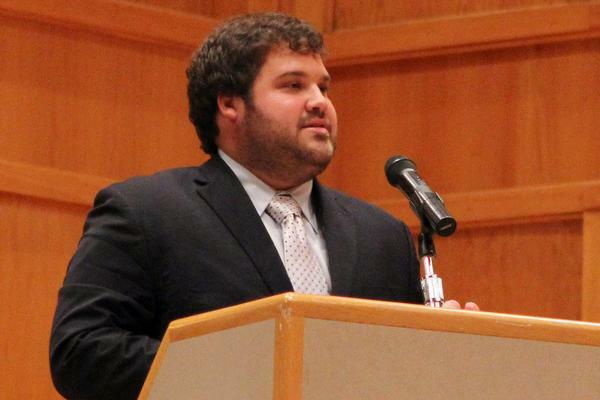 Floyd topped an initial participation of 36 Wabash men, whittled to 16, and then four finalists arguing Tuesday night in Salter Hall. The Noblesville senior competed as a finalist his freshman and sophomore year. He was studying abroad his junior year during the annual event. 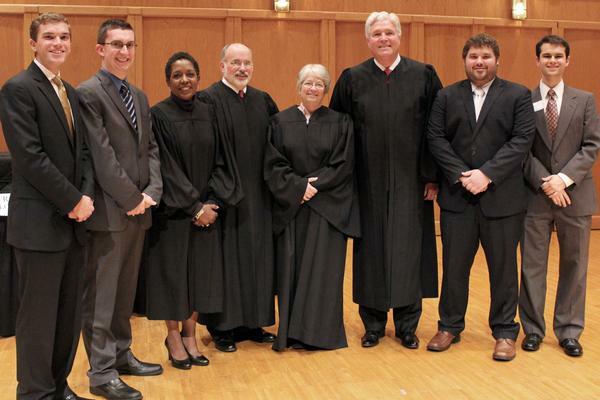 The 19th annual Moot Court Competition was sponsored by Indianapolis Association of Wabash men and the College Rhetoric Department. “I think the coolest thing about tonight is thinking about my freshman year,” Floyd said. “I remember being up on this stage with Alex Ingram (a two-time winner.) 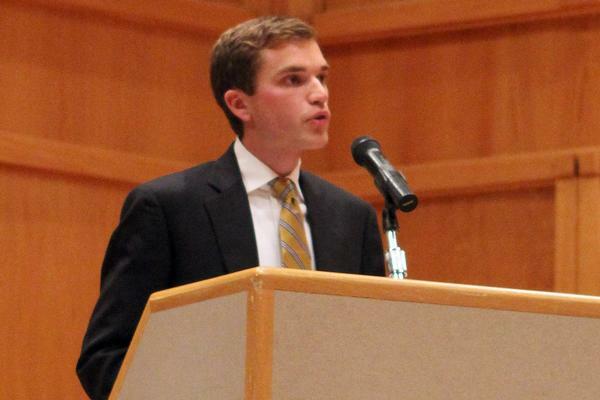 I remember my sophomore year arguing with Kyle Bender ’12. It’s really neat to end on a note that those guys help set. It’s really neat to be an upperclassman and be up on the stage again. It was fun too because we all had a good time and it was tough competition. It’s real cool to see underclassmen in the finals. Four freshmen and four sophomores reached the round of 16. Sophomore Andrew Detmer advanced to the finals. Each year a case is taken from the headlines for the student to argue. 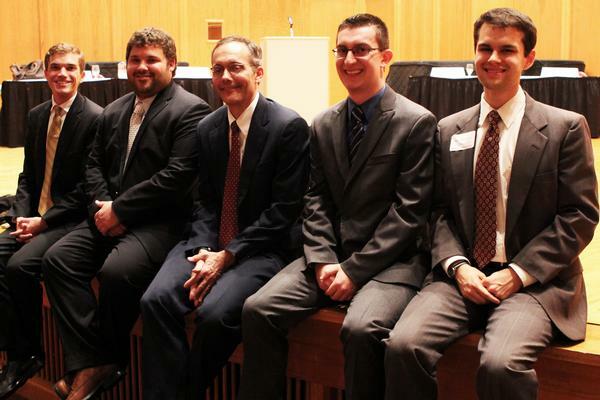 This year the four students argued the Defense of Marriage act to the panel of judges. 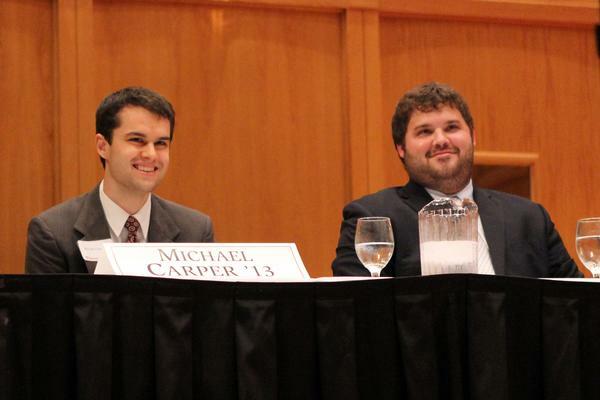 Michael Carper ’13 and Alex Robbins ’13 argued as petitioners on behalf of the government. 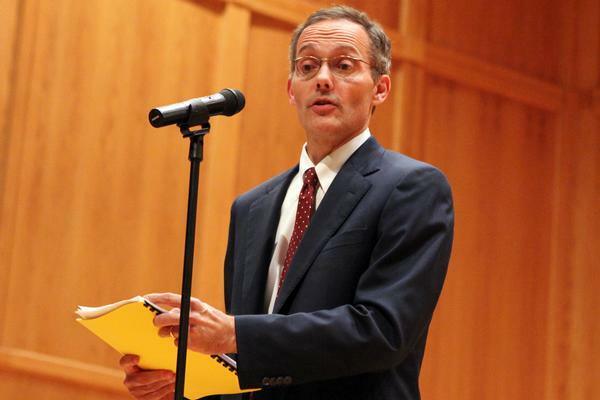 Floyd and Detmer argued as the respondents. The judge’s panel was led by Hon. 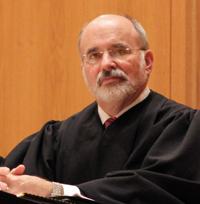 John G. Baker who has served on the Indiana Court of Appeals since 1989. 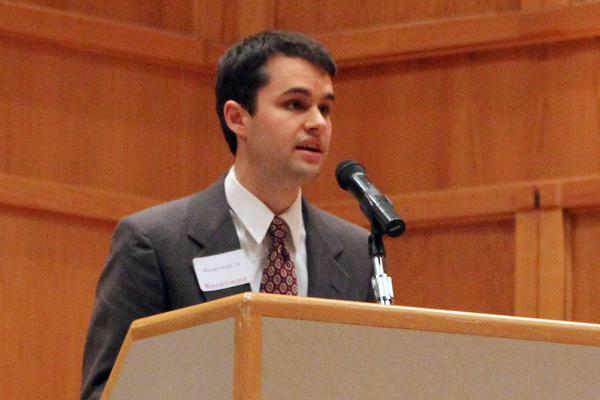 He also is an adjunct professor at IU in the School of Public and Environmental affairs. Hon. 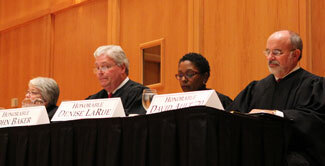 Denise LaRue, a U.S. Magistrate Judge, joined the panel. Judge LaRue practices with Haskin & LaRue and once worked as an attorney for the Indiana Civil Rights Commission. 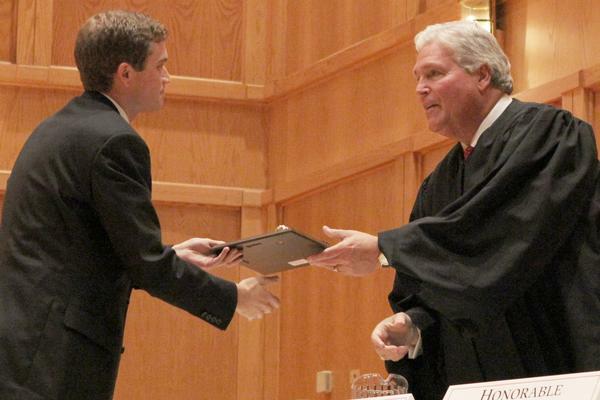 A Moot Court tradition is to ask back a Wabash alum and faculty member. Hon. 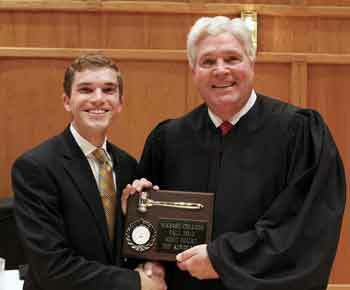 David Ault ‘70, judge of Montgomery County Superior Court 1 took his second turn at judging Moot Court. Dr. Melissa Butler, Political Science Professor, also appeared for the second time. 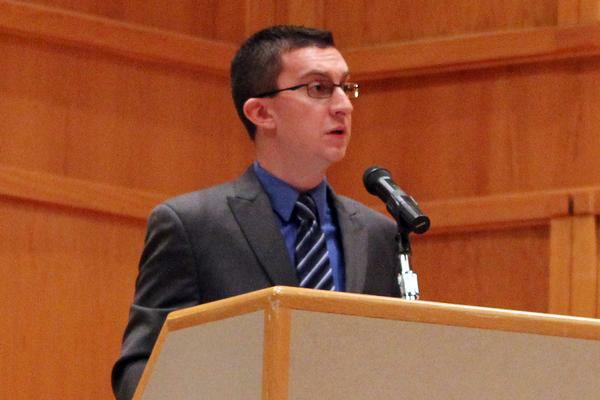 Getting a second invitation is rare, Political Science Professor and advisor Scott Himsel said. 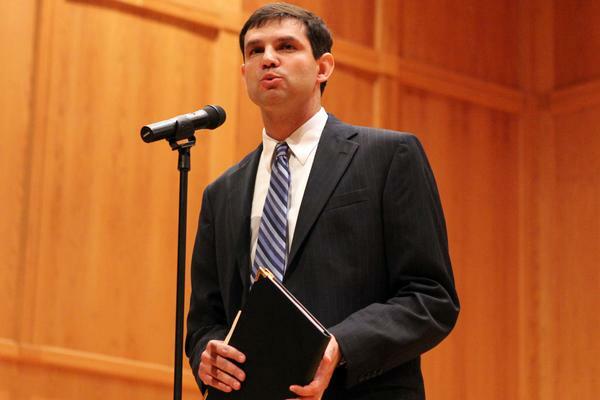 Butler is just the second professor to be asked back in the program’s 19-year history. 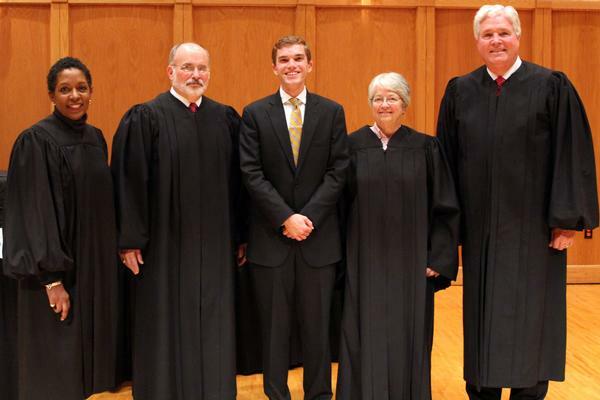 All four judges had something in common and that was their impression of the Wabash men. 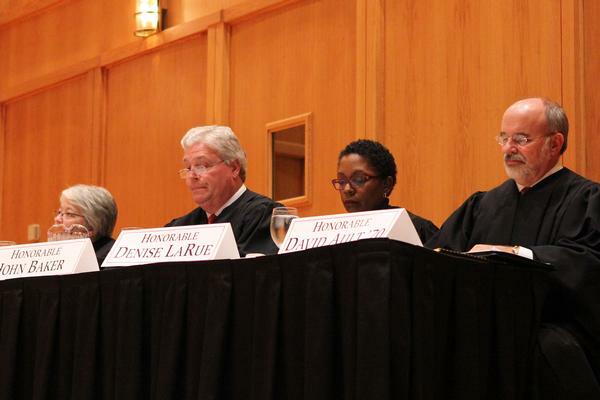 “I don’t think I could compete with these guys anymore,” Judge Ault said. They’re so impressive and they do such a great job. The amazing thing is it’s all just on their own time, their own ticket, no credit and they just want to do this. But citing his preparation, presentation, and poise, Baker announced Floyd the winner. Wabash Alumni lawyers provide financial support for the program and help judge the preliminary rounds. 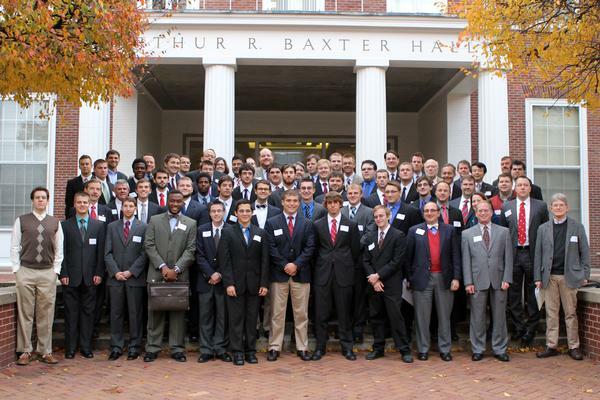 The initial judging was Saturday, Oct. 20, semi-final judging took place Monday, Oct. 22. 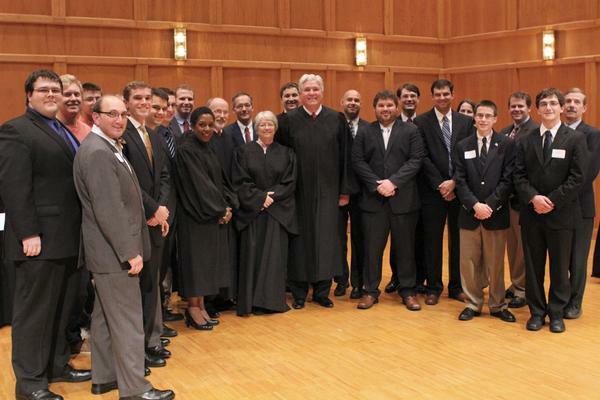 The students argued for 19 Wabash alumni lawyers. Lawrence North High School continued its tradition of bring students interested in law to the Tuesday night finals. Two school buses of students helped fill Salter Hall. 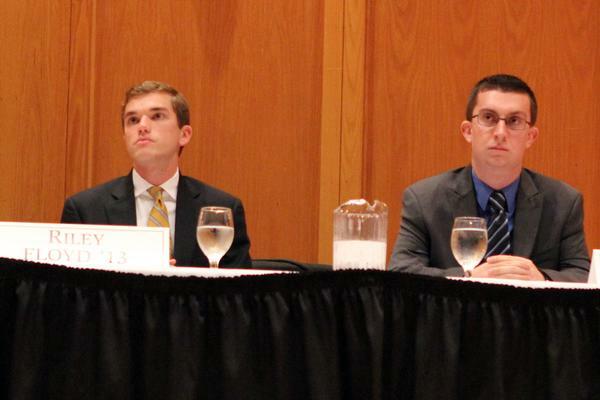 Those students return in the spring to argue the same case in front of Tuesday’s four student finalists.